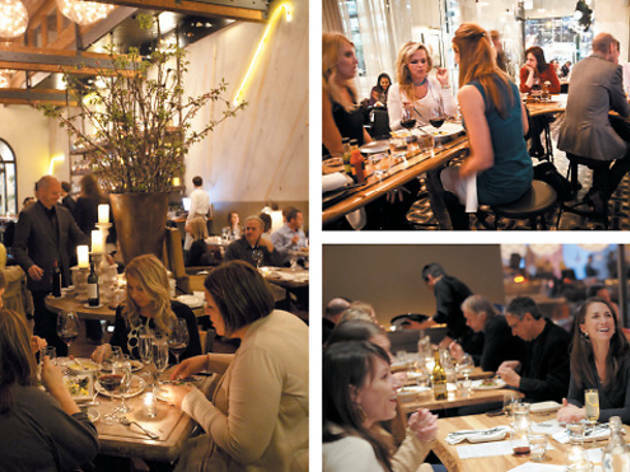 Dining in trendy new restaurants as female culture. In March, New York magazine published a piece asking, “When Did Young People Start Spending 25% of Their Paychecks on Pickled Lamb’s Tongues?” Writer Michael Idov profiles 27-year-old Diane Chang, using her as a synecdoche for the phenomenon of “foodie-ism as youth culture.” “Lately,” Idov argues, “food has become a defining obsession among a wide swath of the young and urbane.” (Horath is a case study in Idov’s hypothesis: “Before, I would have said my favorite thing to do is go to a concert,” she says. “Now it’s going out for a really great meal.”) Is it a coincidence that the subject of Idov’s study (and scorn) is a woman? As someone who goes out to a new restaurant at least four times a week and has noticed, of late, table after table of women—at Tavernita, at Nellcôte, at RPM—I think the answer is no. 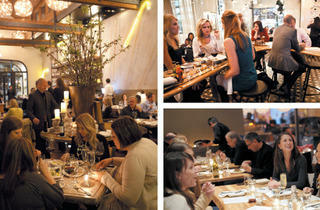 I met Kevin Boehm, the co-owner of the BOKA Restaurant Group, at 9pm on a Saturday at his newest restaurant, Balena. Every seat was full, and the crowd was equal parts men and women, with a few more women in the bar area, and three tables of small groups of only women. (There were no tables of only men.) If we wanted to see women, Boehm told me earlier, we should go to GT Fish & Oyster. “I’ve actually done a head count,” Boehm says. “There’s some nights when it’s 70 percent women inside that restaurant.” The owners of Bread & Wine, a contemporary American restaurant on the Northwest Side, cite the same ratio. “I’m always kind of scratching my head a little bit,” says co-owner Jennifer Wisniewski. “I don’t think it’s ultra-feminine in here. I always thought that we would appeal to men just as much as women.” Her co-owner, Lisa Fosler Kelly, concurs. “We have a male executive chef, and the menu is very meat-heavy. There’s no other explanation for [the preponderance of women] other than that it’s a comfortable space and that women are going out more.” (The two also mention the restaurant’s female ownership as a possible factor.) Most restaurants are not 70 percent female, yet even where the crowds may not slant toward one gender, the enthusiasm (at least for new restaurants) does. “The people who e-mail me and say, Oh my God, when is it opening; I have to be at the opening—it’s a good 70 to 80 percent women,” Boehm says. Could it be that the glossy, modern restaurant is simply more appealing to women than men? Or even that this brand of foodie-ism—the kind that cares more about hitting every spot on the Eater Heat Map than furthering an LTHForum thread on fine examples of carne en su jugo—is less about youth culture than female culture? Or that women tend to socialize in groups at restaurants, where they can really talk? Honestly, I don’t know how to explain it. I have no hard data, no demographic studies and no scientist to back it up: All I know is it’s happening.